I find lots of inspiration for my magical routines from memories of my past. I connect with my audiences as I tell personal stories from my childhood. My latest routine talks about my grandmother who lived around the corner from us in the Barron Park area of Palo Alto. We would walk over to Nana’s house on Sundays for dinner. She would cook a Roast Beef dinner with Yorkshire Pudding. And for dessert, Floating Island. A simple custard topped with a dollop of meringue floating in the center. What I remember the most is the large curio cabinet in her dining room. She referred to that cabinet as, “The British Museum.” She called it that because her husband brought it over from England. My Nana’s cabinet was filled with interesting and mysterious things that she had picked up on her travels. I was fascinated with everything inside. I would stand there and look at each and every piece sitting on the shelves. I was excited when she opened up the two big glass doors and let me touch her collection. Nana passed away in 1974. And eventually, most of the items in her “British Museum” ended up being sold. But, my Dad (her son) gave me a few pieces. 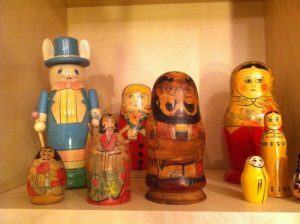 And one of those pieces was her Matryoshka, a Russian nesting doll. It’s the one in the foreground pictured above. I wish I could find out more about the history of this one. It’s very different from any other Russian doll I’ve seen. Unfortunately, the stamp on the bottom has faded. The doll and my Nana’s British Museum is the genesis of a new routine. The theme is about our ”British Museums” and all the memorabilia that we collect over the years. At a recent performance, I was backstage and a woman showed a ring on her finger and mentioned that it was given to her by her late father. As she described it, I could sense the love and special memories she had with her dad. Do you have a “British Museum?” What kind of memorabilia do you collect? What memories do you treasure from your childhood? I hope to be able to share my new routine with you someday.